CHICAGO--(BUSINESS WIRE)-- Hyatt Hotels Corporation (NYSE: H) announced today that a Hyatt affiliate has entered into a management agreement with R.C. Hedreen Company for the operation of a Hyatt Regency hotel currently under development in Seattle, Wash. Expected to open in mid-2018, the premium, full service hotel will be located in Seattle’s Denny Triangle neighborhood at 8th and 9th Avenues between Stewart and Howell Streets in downtown Seattle. The Hyatt Regency brand experience is designed around one objective: to connect today’s travelers to who and what matters most to them. Hyatt Regency Seattle is set to be the largest hotel in the Pacific Northwest, offering 1,260 smartly designed guestrooms, more than 100,000 square feet of flexible meeting and event facilities, multiple food and beverage outlets, and an expansive Regency Club lounge. 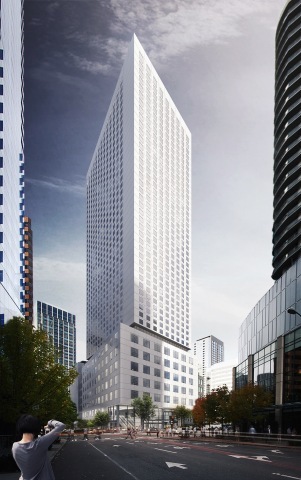 The hotel will be located two blocks from the existing Washington State Convention Center and immediately adjacent to the proposed convention center expansion, making Hyatt Regency Seattle an ideal base for convention attendees. Hyatt Regency Seattle will be located in the center of Seattle and proximate to Pike Place Market, the Space Needle and the Seattle Aquarium, as well as Seattle’s Capitol Hill and Lake Union neighborhoods, connecting guests to retail and dining, entertainment and nightlife venues. R.C. Hedreen Company currently owns Grand Hyatt Seattle and Hyatt at Olive 8. R.C. Hedreen Company and its affiliates have been involved in the development, ownership and management of world-class investment properties since 1963. The company has shifted its focus primarily to luxury hotels over the past decade, but its portfolio of successful projects includes retail, high-rise office buildings and single and multi-family homes. For more information, please visit www.rchco.com.